Bio Health Goodnight is a traditional herbal medicinal product used for the temporary relief of sleep disturbances based on traditional use only. Goodnight should be taken at the recommended dose until symptoms of sleeplessness are relieved, or natural sleep returns. Other ingredients: Sucrose & Lactose, Sodium Starch Glycollate, Talc (E553B), Magnesium Stearate E572), Titanium Dioxide (E171), Iron Oxide Black (E172) Calcium Hydrogen Phosphate, Maltodextrin. Each vegetarian tablet contains 222mg of sucrose and 30mg of lactose. If you have been told by your doctor that you may have an intolerance to some sugars, contact your doctor before taking this medicinal product. Adults and elderly: For the relief of sleep disturbances, take 2 tablets 30 minutes before bedtime. Do not exceed the stated dose. This product contains sucrose and lactose. Avoid alcohol drink. May cause drowsiness. If affected do not drive or operate machinery. If symptoms persist or worsen after 4 weeks or adverse reactions not mentioned in the leaflet occur, consult a doctor or qualified heathcare practitioner. Please read the enclosed leaflet before use. 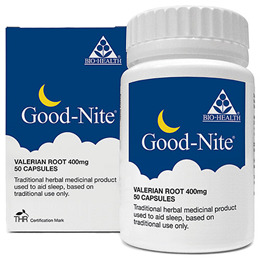 Below are reviews of Bio Health Good-Nite - Valerian Root - 50 x 400mg Capsules by bodykind customers. If you have tried this product we'd love to hear what you think so please leave a review. It worked quite well the first time but not the second. This product seems to work most nights.